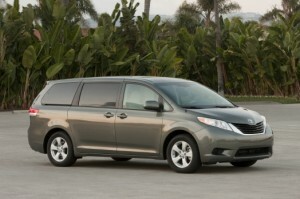 Popular for their ability to haul family members and plenty of cargo, the top selling minivans July 2011 prove once again that competition is fierce in this segment. The top three leaders – make that the top four – only shift spots rarely. That’s because they’re fresh designs and have plenty of optional safety and high-tech features that are sure to please. 5. 2011 Kia Sedona – Car and Driver praises Kia’s “old-fashioned sliding-door minivan” for its many attributes, saying, “Kia’s own kid-bus has a long list of standard features and options, all at value prices. A long wheelbase and a new, 271-horsepower 3.5-liter V-6 with a six-speed auto are further inducements.” For July, the 2011 Kia Sedona winds up in fifth place with sales of 2,825 for the month and year-to-date sales totaling 13,831.